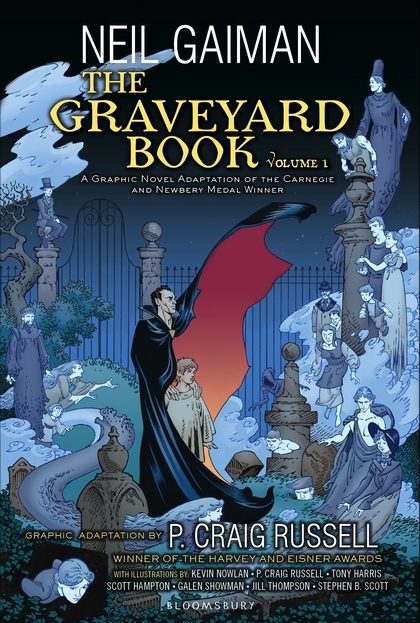 Neil Gaiman & P. Craig Russell, Jill Thompson, Kevin Nowlan, Scott Hampton, Tony Harris, Stephen B. Scott, Galen Showman. "The dead should have charity." The thing about childhood is this: only an adult will look back on it thinking, "That's odd!" ?!" Whatever your childhood, it seems the norm whilst you're living it. Obviously that's not always a good thing. Nobody Owens was his adoptive name but everyone called him Bod. His birth parents were murdered one night by a very bad man with a very sharp knife and a mission. Bod was no more than a toddler with a precocious and somewhat worrisome propensity for straying but that night it saved his young life. He'd heard a crash downstairs, woke up and wandered through his home's open front door, up the hill under moonlight to the simple, padlocked, wrought iron gates of the graveyard and squeezed through. The bad man with a knife whose business was not yet complete followed the infant's milky scent and clambered over the thick, stone walls in pursuit. But there he was met by a tall, gaunt man with the palest of skin, jet-black hair and an equally obsidian cloak. He looked vaguely aristocratic and his manner was utterly compelling. No child could or would be found here: more likely in the town down below. So it was that Bod was taken in by the graveyard folk - the ghosts of those long since passed - and raised as one of their own. With centuries of knowledge between them Bod's education is eclectic if somewhat arcane, but it will stand him good stead for what his fiercely inquisitive nature will lead him to encounter both inside the graveyard and when he strays oh so dangerously out. Fortunately he has a quiet yet determined guardian in Silas, the very tall man with the very pale skin and the very dark hair. Silas is no ghost as you have probably gathered; nor is he still amongst the living. 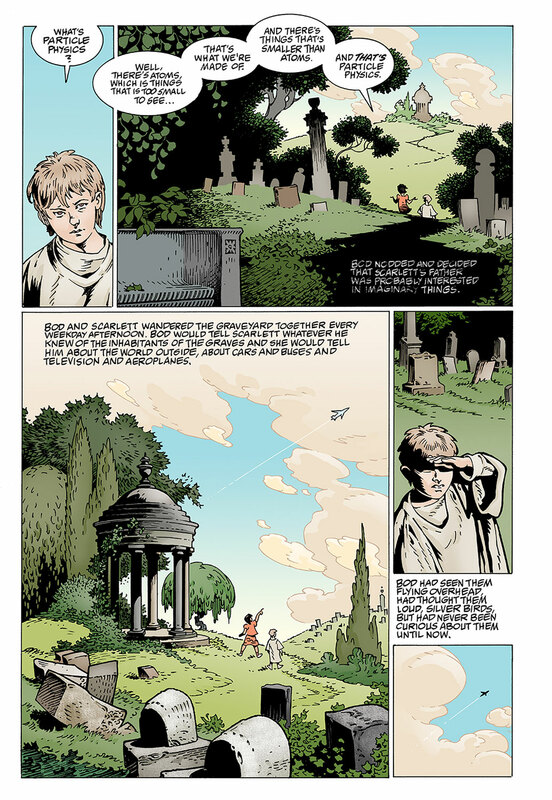 If I didn't know better I would swear this was autobiographical: you can imagine Neil Gaiman growing up in a graveyard, can't you? He knows almost too much about Mist-Folk, Ghoul-Gates and Night-Gaunts: which to avoid and how to cry out for help in their languages. 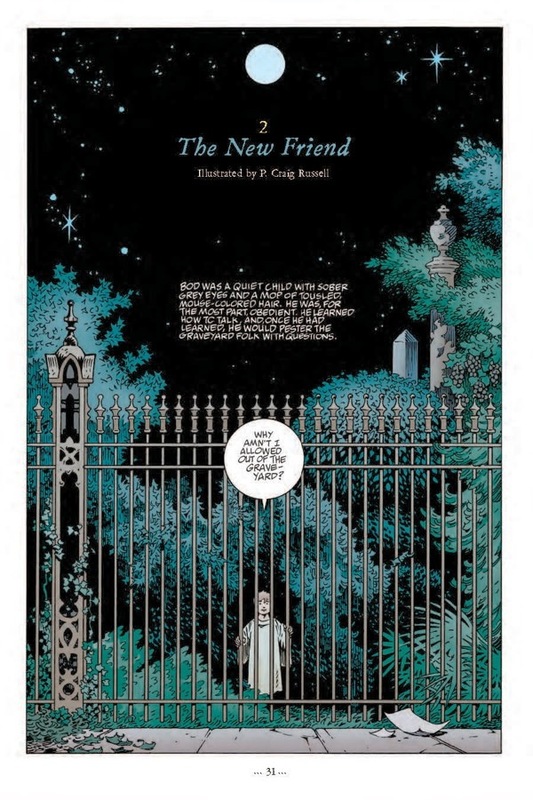 This is the first half of P. Craig Russell's adaptation of Gaiman's prose novel and he draws the second chapter himself. 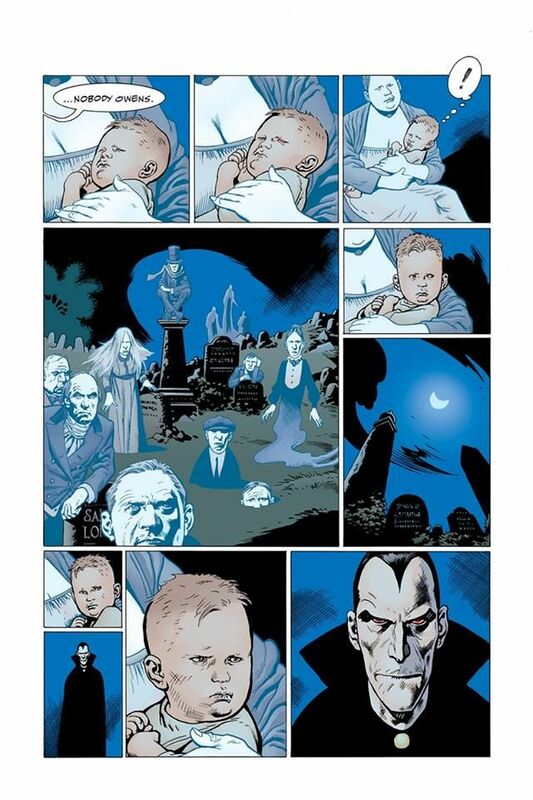 He's brought along some friends for each of the others: MAGIC TRIXIE and SCARY GODMOTHER's Jill Thompson, Kevin Nowlan, Scott Hampton, Tony Harris, Stephen B. Scott and Galen Showman whom you could not tell apart from P. Craig Russell himself, such are the crisply cut leaves, their shadows and the stones. Some have adapted their styles more than others; it's a perfectly congruous whole. Each chapter moves on a couple of years with elements reprised, Bod's nightgown seemingly growing with him as the young man learns his lessons through making mistakes: breaking rules, testing boundaries and learning to care for others no matter what other people think. As always with Gaiman there are a couple of moments of such pure kindness that you cannot help but emit a little choke. He understands childhood as readers of THE OCEAN AT THE END OF THE LANE will know, and Silas' role as guardian is particularly poignant. I worry for him. "But you'll always be here, Silas, won't you? And I won't even have to leave, if I don't want to?"